I should have got to this yesterday; I don’t know. Something happened. Should be back to normal Sunday. Bill Rechin’s Crock rerun for the 26th of April does a joke about picking-the-number-in-my-head. There’s more clearly psychological than mathematical content in the strip. It shows off something about what people understand numbers to be, though. It’s easy to imagine someone asked to pick a number choosing “9”. It’s hard to imagine them picking “4,796,034,621,322”, even though that’s just as legitimate a number. It’s possible someone might pick π, or e, but only if that person’s a particular streak of nerd. They’re not going to pick the square root of eleven, or negative eight, or so. There’s thing that are numbers that a person just, offhand, doesn’t think of as numbers. Bill Rechin’s Crock rerun for the 26th of April, 2018. Going ahead and guessing there’s another Crock with the same setup, except the prisoner guesses nine, and Crock says it was 4,796,034,621,322, and then in the final panel we see that Crock really had thought nine and lied. 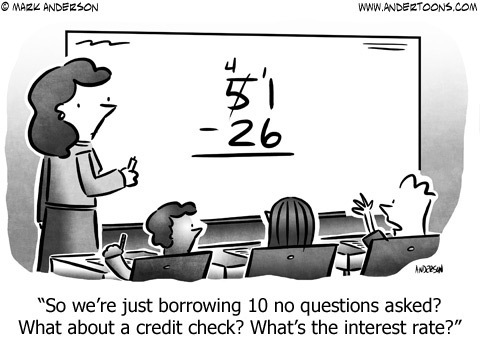 Mark Anderson’s Andertoons for the 26th sees Wavehead ask about “borrowing” in subtraction. It’s a riff on some of the terminology. Wavehead’s reading too much into the term, naturally. But there are things someone can reasonably be confused about. To say that we are “borrowing” ten does suggest we plan to return it, for example, and we never do that. I’m not sure there is a better term for this turning a digit in one column to adding ten to the column next to it, though. But I admit I’m far out of touch with current thinking in teaching subtraction. Mark Anderson’s Andertoons for the 26th of April, 2018. This is Mark Anderson’s Andertoons for the week. Greg Cravens’s The Buckets for the 26th of April, 2018. I’m not sure Larry (the father)’s disbelief at his kid figuring putting the shirt on all wrong was bound to happen. It’s a mistake we all make; accepting the inevitability of that doesn’t seem that wrong. Charles Schulz’s Peanuts rerun for the 27th is surely set in mathematics class. The publication date interests me. I’m curious if this is the first time a Peanuts kid has flailed around and guessed “the answer is twelve!” Guessing the answer is twelve would be a Peppermint Patty specialty. But it has to start somewhere. Charles Schulz’s Peanuts rerun for the 27th of April, 2018. This strip first ran the 30th of April, 1971. It also was rerun the 25th of April, 2003, with a different colorization scheme for some reason. Knowing nothing about the problem, if I did get the information that my first guess of 12 was wrong, yeah, I’d go looking for 6 or 4 as next guesses, and 12 or 48 after that. When I make an arithmetic mistake, it’s often multiplying or dividing by the wrong number. And 12 has so many factors that they’re good places to look. Subtracting a number instead of adding, or vice-versa, is also common. But there’s nothing in 12 by itself to suggest another place to look, if the addition or subtraction went wrong. It would be in the question which, of course, doesn’t exist. Maria Scrivan’s Half-Full for the 28th of April, 2018. Hey, cartoonists deserve easy days at work too. And there’s not always a convenient holiday they can have the cast just gather around and wish everyone a happy instance of. Maria Scrivan’s Half-Full for the 28th is the Venn Diagram joke for this week. It could include an extra circle for bloggers looking for content they don’t need to feel inspired to write. This one isn’t a new comics tag, which surprises me. Zach Weinersmith’s Saturday Morning Breakfast Cereal for the 28th of April, 2018. If I had seen this strip in 2007 maybe I would’ve got that tenure-track posting instead of going into the world of technically being an extant mathematics blog. Zach Weinersmith’s Saturday Morning Breakfast Cereal for the 28th uses the M&oum;bius Strip. It’s an example of a surface that you could just go along forever. There’s nothing topologically special about the M&oum;bius Strip in this regard, though. The mathematician would have as infinitely “long” a résumé if she tied it into a simple cylindrical loop. But the M&oum;bius Strip sounds more exotic, not to mention funnier. Can’t blame anyone going for that instead. Ha ha! Yes, I do like that. Haven’t seen Campus Clatter that I remember but the setup works clearly enough.